Filo, Carrie’s house mom when she was studying in Florence, makes a delicious Gattò di Patate. She wrote down the recipe in Italian for Carrie, and Carrie translated it for me. It’s interesting to note that Filo, who is from Naples, uses a recipe almost identical to Arthur Schwartz’ recipe in Naples at Table. (This is a great cookbook if you want authentic Neapolitan recipes. It’s out of print, but still available used.) The main difference between the two is that Filo uses 3 whole eggs plus 1 egg yolk, and Arthur uses just 1 egg. 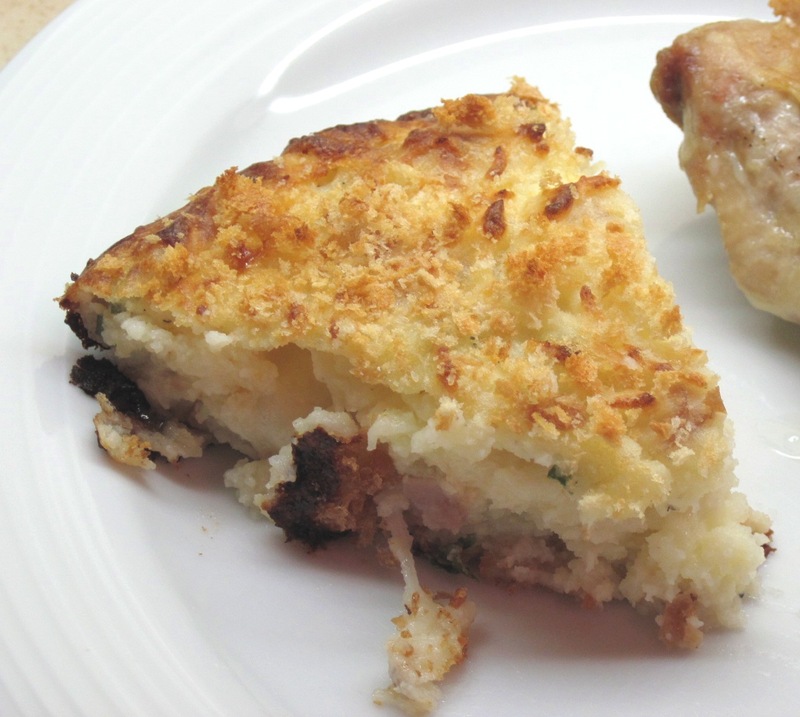 Filo also uses a combination of Parmesan and Romano cheeses; Arthur uses just Parmesan. I went with Filo’s version. 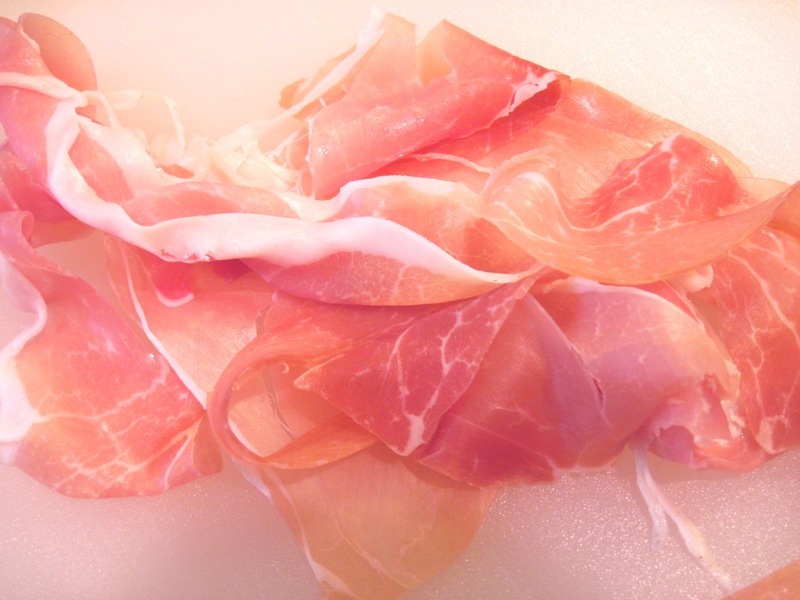 I have made Gattò di Patate with salami, but this time I used prosciutto which I think I prefer. There is one thing puzzling to me about both of the recipes. Both Filo and Arthur say to use a 10-inch round pan, but the quantity of ingredients that they use makes enough to fill two 10-inch pans! The first time I made it I ended up using my largest 10×15 inch Pyrex baking dish and it barely fit. This time I made half of the recipe and it perfectly filled my pie dish. Arthur states that this is Campania’s most elaborate potato dish and it has become famous outside of the region. Because it is so rich, it is usually served with a simple grilled meat; Arthur suggested roast chicken. I put some chicken thighs in the oven with the Gattò di Patate and made a salad while they were baking. Here’s my version of half of the recipe. It will easily serve 6 – 8 people. Just double it if you want to make a large pan or two 10-inch round pans. If you double it and want to make Filo’s version, use 3 eggs plus 1 egg white. 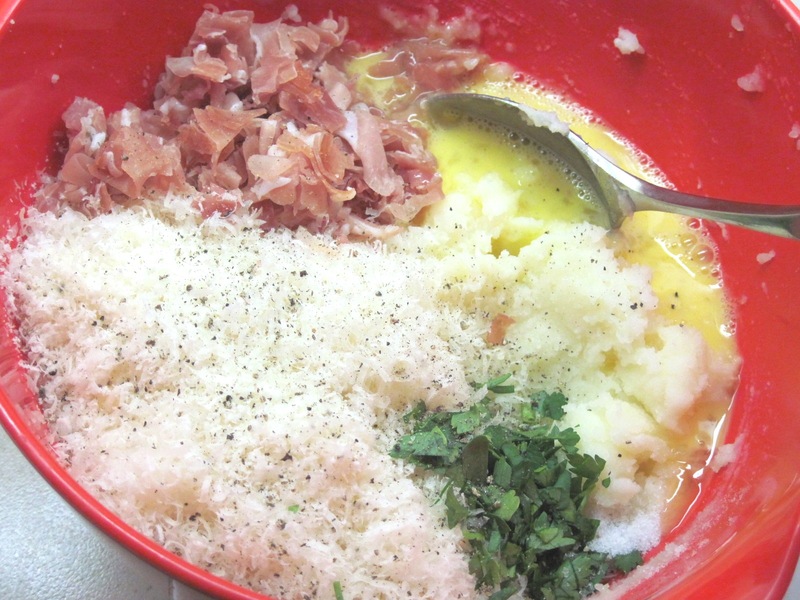 Blend in the butter, parmesan, Romano, eggs, prosciutto or salami, the parsley, salt and a couple of grinds of black pepper. Add the milk and stir it well. 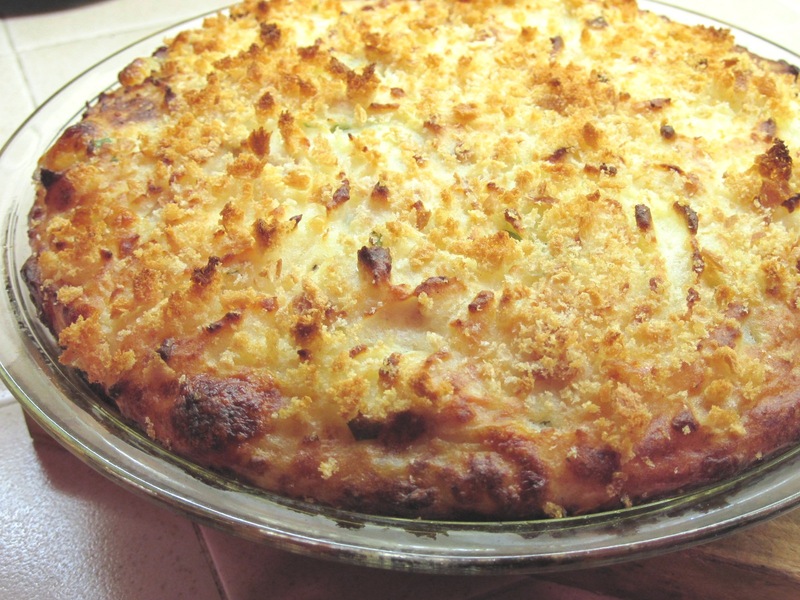 Grease a 10-inch pie plate or cake pan with butter and cover with bread crumbs. 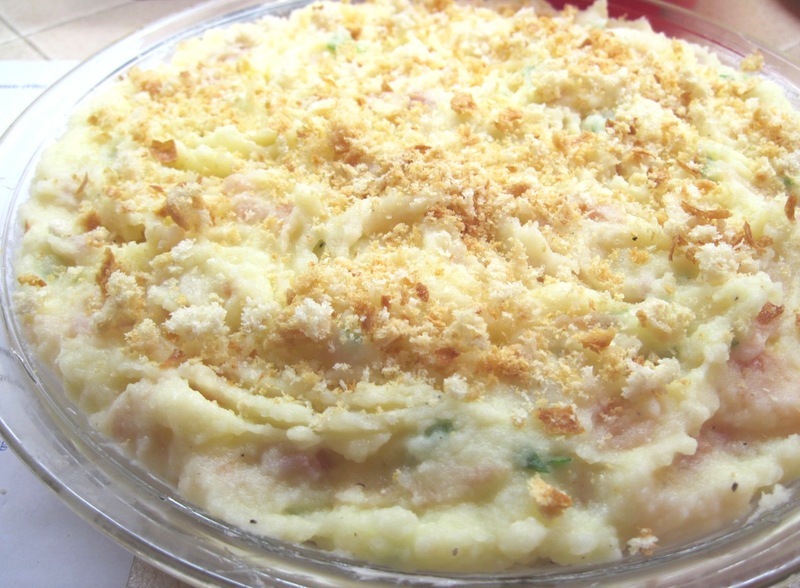 Gently put about half of the potato mixture in the pan, spreading it over the crumbs. 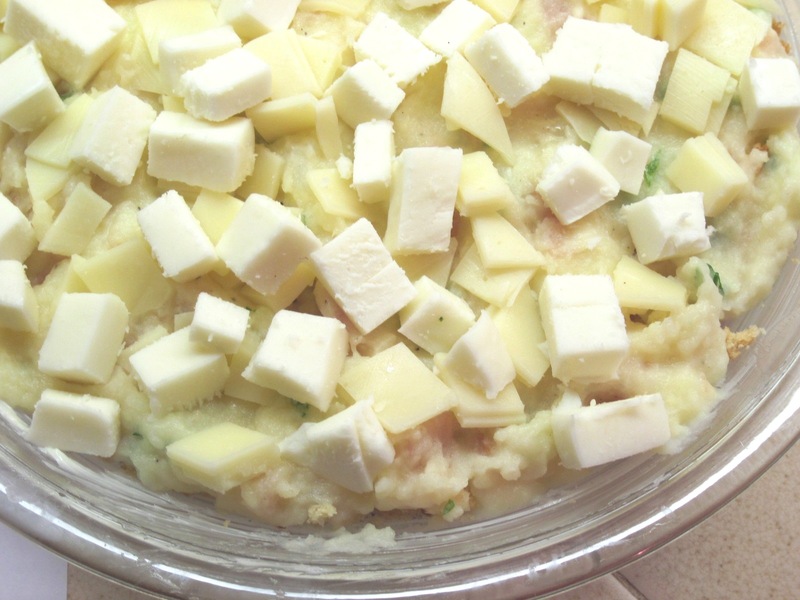 Put the provolone and mozzarella over the potatoes (seen left); cover with the rest of the potato mixture. Smooth the surface, cover with breadcrumbs, add some slices of butter, and put in the oven until the gattò is browned. It takes 30 to 45 minutes. Filo noted that some people put a thin layer of béchamel sauce over the mozzarella, but that seems a bit excessive to me. 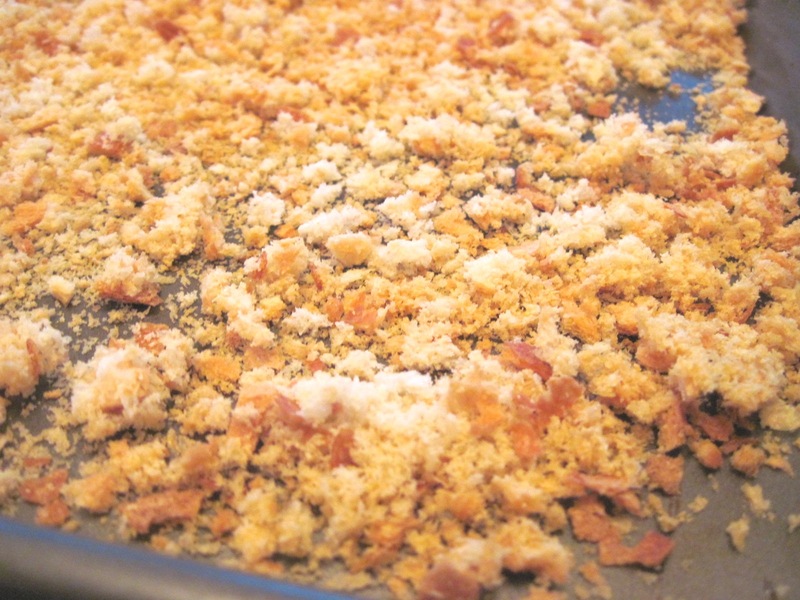 *It’s easy to make your own bread crumbs if you have a food processor. Just tear some Italian or French bread into small pieces and process. Spread them out on a baking sheet and bake at 350˚ for about 15 minutes, stirring once or twice. Let them cool off. If you don’t have a food processor, you can buy plain unseasoned bread crumbs.